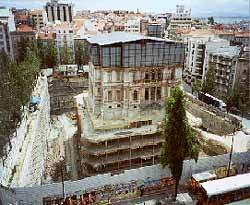 Lisbon, Portugal: Here in the center of Lisbon, a seven-level underground shopping center and parking garage are being built around and under the Palais Sotto Mayor. The palace, constructed in the first decade of the 1900s, is a popular tourist attraction and reflects the style and riches of Portugal's colonial past. In the photo at right, you can see the palace, now an island surrounded by a 35-meter deep excavation. Three types of retaining structures were used to stabilize the excavation: 0.6 and 1-meter thick diaphragm walls, 1-meter diameter continuous bored piles with 0.8 meter spacing, and 0.35 meter thick Berlin-type concrete walls. The palace itself was stabilized by micropiles and continuous bored piles. Lisbon city authorities required that the project be monitored intensively to protect the palace and nearby buildings, subway tunnels, and roadways as nearly 150 thousand cubic meters of soil were removed. To monitor movements along the diaphragm walls and adjacent to the tunnels, 68 tieback anchors were equipped with anchor load cells. Surface survey points, including 28 reflex targets and 31 leveling marks, were installed on buildings around the excavation. Fourteen inclinometers were installed to monitor lateral movements adjacent to the tunnels and major buildings. A portable tiltmeter and tilt plates were also used. A tape extensometer was used to monitor the convergence in the subway tunnel, and four VW piezometers were installed for monitoring dewatering. The excavation, now in its final stages, took about nine months. To date, instrumentation has shown that displacements are smaller than predicted and within acceptable limits. Thanks to Dr. J.M.M. dos Santos, Tecnasol FGE for providing this story and the Lisbon National Library for the historical facts and photograph. Tecnasol FGE are the structural engineers and main construction contractor for the project.